Did you like BoY? Want to interact with filmmaker Auraeus Solito? Share your feedback here, we'd love to hear from you! Send email to the BoY team at boythemovie@gmail.com. BoY will be screened at the Cultural Center of the Philippines (CCP) Little Theater on Friday, July 24, 2009 at 6:15 p.m., as part of Cinemalaya’s Network for the Promotion of Asian Cinema (NETPAC) Jury competition. For details about the Cinemalaya Film Festival or for ticket sales info, call the CCP Box Office at 8321125 local 1406. BoY Trailer is Now Online! Watch the BoY trailer right here! Scroll to the bottom of this page or visit the Wolfe Releasing Channel on YouTube here. BoY Named One of the Best in Outfest 2009 by L.A. Weekly! "Boy is a fascinatingly subtly tense slice of gay life in a country quite different from ours..."
To read the complete article, visit LAweekly.com. BoY Plays to Sold Out Crowd in Los Angeles! July 17, 2009. LOS ANGELES. Lines formed outside the Fairfax movie theater and around the block as fans waited in anticipation for the Los Angeles premiere of BoY, the latest film by director Auraeus Solito. The film screened as part of the 2009 Los Angeles Gay & Lesbian Film Festival, or Outfest. According to Outfest organizers, tickets to BoY sold out three days before the screening. The capacity crowd filled the theater and cheered loudly as the final scene unfolded and credits rolled. In the theater lobby, the buzz after the movie was loud and never-ending as audience members milled around and shared their movie experience with others in the audience. The Los Angeles audience demonstrated that audiences around the world have been waiting for a long time for a movie like BoY. Thank you, Los Angeles, for showing the world that BoY has truly arrived! BoY Selected for Gay.com's Top Ten List! Gay. com has selected BoY as one of the Top Ten Highlights for the Boys from "the biggest queer film festival on earth" (aka Frameline33: The San Francisco International LGBT Film Festival). Frameline33 screened more than 225 feature films, short stories and documentaries during its festival run from June 18 to June 28, 2009. BoY drew huge crowds during its multiple screenings at Frameline33. 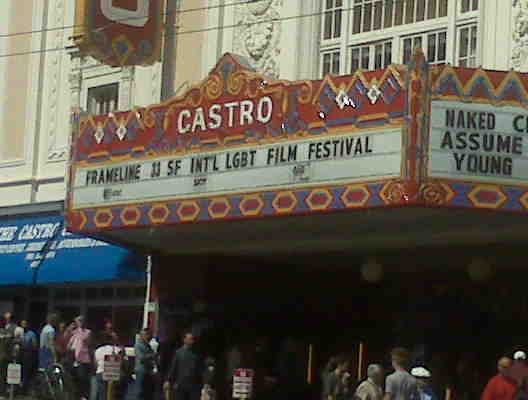 International media reported on BoY's successful screenings at Frameline33, noting in particular how the audience loved the movie. According to Gay.com, BoY is one of the movies that "you'll be wanting to add to your Netflix queue in the coming year or be looking for at a queer film fest near you — especially if you live in Los Angeles (Outfest.org) or Philadelphia (QFest.com) where those ginormous LGBT film festivals kick off this weekend as well!" San Francisco, CA - “BoY,” the latest film by internationally acclaimed director Auraeus Solito (“The Blossoming of Maximo Oliveros”) will be shown at the 2009 San Francisco International LGBT Film Festival (Frameline 33) on Friday, June 19, 2009 at 9:30 pm and on Saturday, June 27, 2009 at 4:15 pm. Both screenings take place at the Victoria Theater, located at 2961 16th Street, San Francisco, CA, USA 94103. Set in a vibrant urban landscape in the Philippines, “BoY” is a coming-of-age story about a young middle-class man who falls in love with a dancing rent-boy (a.k.a. "macho dancer") named Aries. The young budding poet, who is unnamed, observes lip-synching drag-queens and dancing rent-boys in a gay bar one evening and finds himself attracted to Aries. Selling his prized collection of action heroes and comic books in order to afford Aries for one night, the poet brings Aries home for the New Year. Sparks fly while celebratory fireworks go off outside the house and the men forge a fragile connection that neither of them is certain will last. This is an idealistic, coming-of-age tale of a young man who arrives at his first lesson about love, and who learns to grow confidently into his own sexuality. Principal cast members include Aeious Asin, Aries Pena, Madeleine Nicolas and Nonie Buencamino. According to Solito: “Initially, I was so happy that the film festival in Singapore selected the film for competition. It however became a great disappointment that the censors in Singapore disallowed the film from screening in the festival. The phrase "normalises homosexuality" and "romanticise" very clearly articulates their homophobic view. To the censors, I want to send the message: "Gay people also make love." Auraeus Solito's first feature film The Blossoming of Maximo Oliveros won 15 international awards. A gay love story set in Manila, Solito's film was a part of the 2006 Sundance Film Festival, the Las Palmas Film Festival, and the Cinemalaya Independent Film Festival and won three awards at the 2006 Berlin Film Festival. His film also earned a Best Foreign Film nomination at the 2007 Film Independent's Spirit Awards. TULI, his second feature film, won Best Picture and Best Director at the Digital Competition at the 2005 CineManila Film Festival and the NETPAC Jury Prize at the Berlinale, International Forum for New Cinema; 2nd Prize for Best Feature Film at the Montreal Film Festival. He made Philippine Science, his third dramatic feature film, in 2007, which won awards at the 14th Vesoul International Film Festival of Asian Cinema in France. sweet and fragile in a way that brings a freshness to the film. Boy explores the relationship as a life-changing moment as the sensitive poet learns to grow more confident and assured in his sexuality..."
Take a Sneak Peek at BoY! Watch the BoY Trailer Here! Join the BoY Club Today and Receive Exclusive BoY Pictures and News! Take a Sneak Peek at BoY! Watch the BoY Trailer Here!